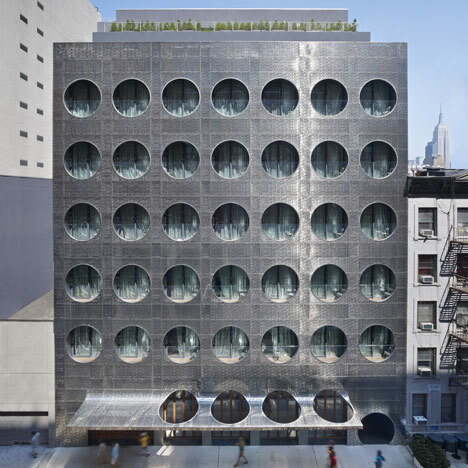 American firm Handel Architects have completed a New York hotel with porthole windows that give it an uncanny resemblance to children's game Connect Four. Comprising one seven-storey block adjoined to another that is twelve storeys high, the Dream Downtown Hotel occupies a renovated former annex of the National Maritime Union of America. Overlapping layers of perforated metal clad the smaller of the two blocks, where the circular openings create juliet balconies for the guest rooms behind. Porthole windows also feature on the taller block, which has a slanted exterior of stainless steel tiles. The architects split the building into two during the renovation, when they removed the middle sections from four floors to create a screened pool terrace at the centre. The hotel building also contains two restaurants, a gym, an event space and shops. See more stories about hotel architecture in our dedicated category. Photography is by Bruce Damonte, apart from where otherwise stated. Two years later, he designed an annex for the headquarters on the site where Dream currently sits. A few years later, Mr. Ledner designed a flanking wing for the annex, which would eventually be converted to the Maritime Hotel. In the 1970s, the Union collapsed and the buildings were sold and used for various purposes in the years that followed. In 2006, Handel Architects was engaged to convert the main annex into the Dream Downtown Hotel. The otherness of Ledner's 1966 design for the National Maritime Annex was critical to preserve. Along the 17th Street exposure, the sloped façade was clad in stainless steel tiles, which were placed in a running bond pattern like the original mosaic tiles of Ledner's Union building. New porthole windows were added, one of the same dimension as the original and one half the size, loosening the rigid grid of the previous design, while creating a new façade of controlled chaos and verve. The tiles reflect the sky, sun, and moon, and when the light hits the façade perfectly, the stainless steel disintegrates and the circular windows appear to float like bubbles. The orthogonal panels fold at the corners, continuing the slope and generating a contrasting effect to the window pattern of the north façade. The 16th Street side of the building, previously a blank façade when the building served as an annex, was given new life. The skin is constructed of two perforated stainless steel layers, its top sheet of holes a replication of the 17th Street punched-window design and the inner sheet a regular perforation pattern. The outer rain screen is punctured with porthole-shaped Juliet balconies for the guestrooms and peels up at the ground level to form the hotel canopy and reveal the hotel entrance. The original through block building offered limited possibilities for natural light. The glass bottom pool allows guests in the lobby glimpses through the water to the outside (and vice versa) connecting the spaces in an ethereal way. Light wells framed in teak between the lobby, pool and lower level levels allow the space to flow. Two hundred hand blown glass globes float through the lobby and congregate over The Marble Lane restaurant filling the space with a magical light cloud. Fixtures and furnishings were custom designed for the public spaces and guestrooms to complement the exterior design and to continue the limitless feeling of space throughout the guest experience.